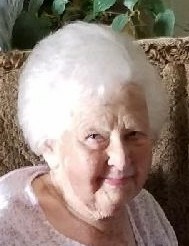 Helen M. Mader, 89, of Grantville passed away Wednesday, August 22, 2018 in the M. S. Hershey Medical Center. Born December 11, 1928 in Harrisburg, she was a daughter of the late Walter and Sallie (Hoover) Fulk and was also preceded in death by her husband of 70 years Leonard A. Mader on October 7, 2016, son Donald Mader and brother Herbert Fulk. Retired from H. B. Reese Candy Company with 30 years of service, she was a member of East Hanover Township Autumn Leaves and Shellsville V. F. W. #9639 Ladies Auxiliary. She enjoyed flower gardening and baking cakes for her grandchildren’s birthdays. Surviving are her children Elaine Royer, Ernest, husband of Mary Jane Mader, Glenn, husband of Lynne Mader, and Joseph, husband of Shelley Mader; daughter-in-law Judith Mader; sisters Irene Williams and Ruth Lindsey; grandchildren Douglas, Brian, Lisa, Denise, Jeremy, Kim, Dan and Laura; and 13 great grandchildren. The family would like to thank Mike Chambers for his dedication and love to their mother. A funeral service will be held 11:00 AM Saturday, August 25, 2018 at St. John’s United Methodist Church, 165 Firehouse Road, Grantville preceded by a viewing beginning at 9:30 AM. Interment will be in Grantville Cemetery. In lieu of flowers, contributions may be made to Shellsville V. F. W. #9639 Ladies Auxiliary, PO Box 374, Grantville, PA 17028.